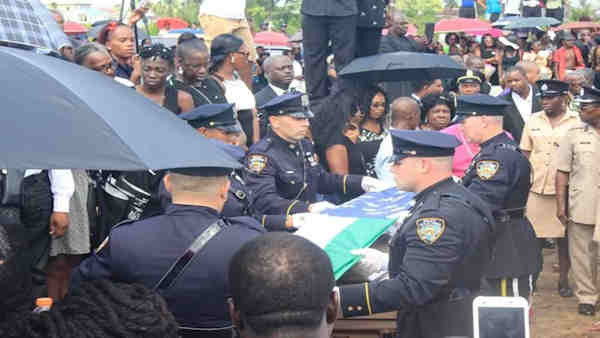 GEORGETOWN, Guyana -- Scores of New York City police officers were among hundreds of mourners who stood in the rain Saturday as their slain comrade Randolph Holder Jr. was buried in his native Guyana. After a service at Georgetown's main Catholic church, Holder was laid to rest with a 21-gun salute at the city's sprawling cemetery with uniformed NYPD and Guyana police and Guyana President David Granger standing by. Holder was "a humble man, a true hero of the NYPD, a true hero of Guyana," said one of the officer's supervisors, Capt. Reymundo Mundo. A 5-year NYPD veteran, Holder was killed in the line of duty on Oct. 20 while responding to a report of shots fired and a bicycle stolen at gunpoint in Manhattan's East Harlem neighborhood. A suspect has been arrested and charged with fatally shooting the officer in the head. Holder finished high school in the South American country and then moved to New York to live with his father, who also served in the NYPD. NYPD Commissioner William Bratton posthumously promoted Holder to detective and issued him a new gold shield with the same number of the badge worn by his father. "He told me that the job was getting scary but this is a risk he had to take," said Holder's uncle, Desmond King. "I feared for him."